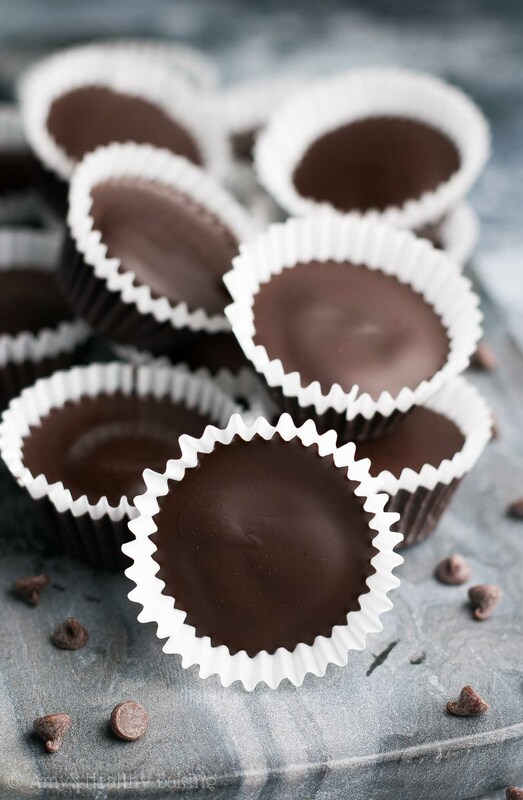 An easy recipe for homemade dark chocolate peanut butter cups with a cozy spiced pumpkin filling! So much better than store-bought & only 40 calories! Towards the beginning of August, I called my mom to chat and catch up. I asked about her work, their cabin, and their visit to see their friend’s golden retriever puppies (they’re bringing one home in September!). Mom had texted me pictures of the adorable little dogs the night before, and I wanted to hear all about those cute fur balls! In that moment, I felt as if a huge weight had been lifted off of my shoulders. I knew why my blogging energy level felt lower than usual… And I knew how to fix it! 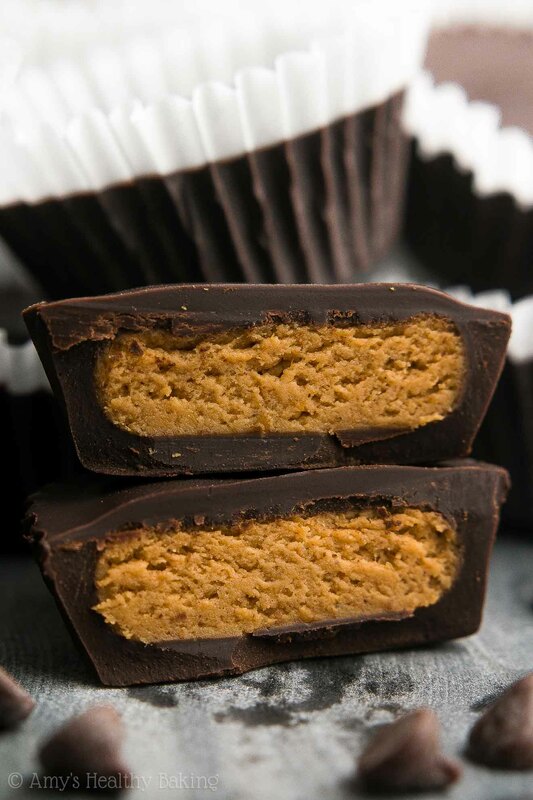 These Healthy Pumpkin Spice Peanut Butter Cups! They taste luxurious and decadent and rich—aka way better than the Reese’s cups I grew up eating! And when your teeth sink into that delicious dark chocolate and hit the filling… It’s an explosion of cozy fall flavors with the pumpkin and spices that simply melt in your mouth. 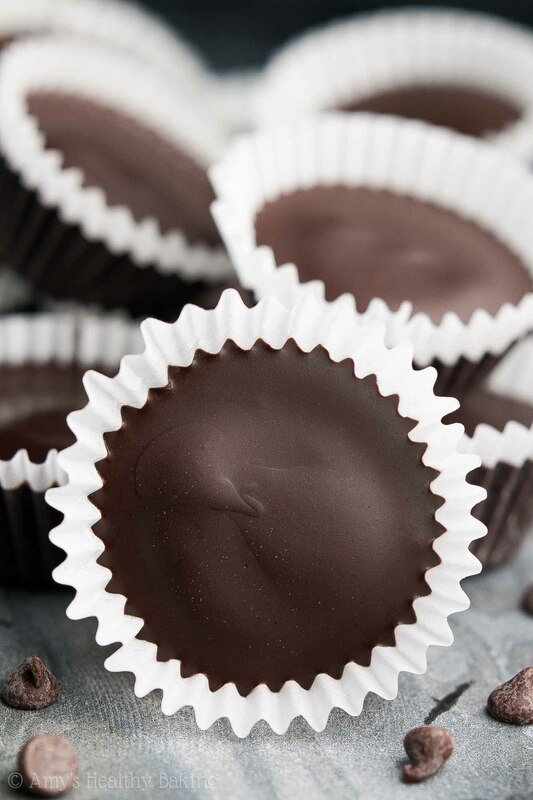 And unlike those store-bought peanut butter cups, these are made from entirely wholesome ingredients—no added sugar or crazy, artificial ingredients here!—and only 40 calories! So let’s talk about how to make this healthy candy recipe! These gems are actually really simple to make… Just slightly more time-consuming than I originally anticipated. (Maybe because I put on a baseball game in the background and stopped to cheer too many times?…) But I think that’s what fall, and therefore pumpkin season, is all about: slowing down, embracing the process, and savoring the moment. Or maybe just savoring an extra pumpkin spice peanut butter cup. I won’t judge! 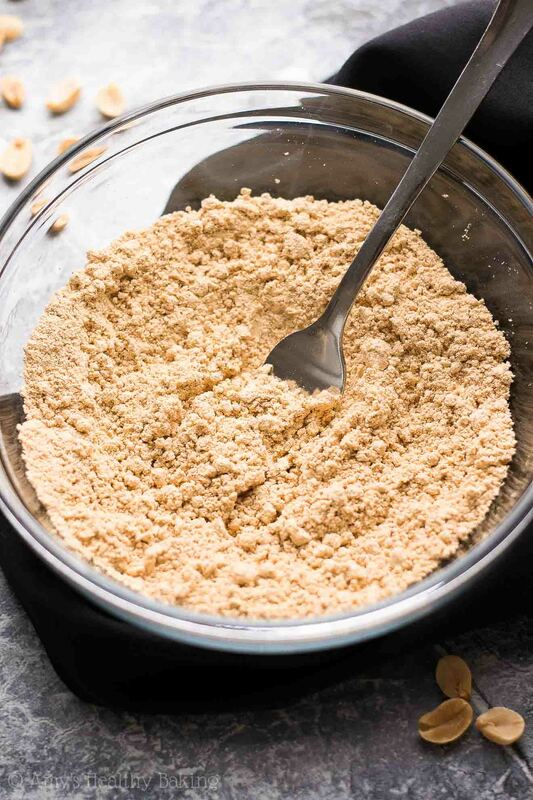 To make the filling, you’ll mix together peanut flour (like this), pumpkin pie spice (I made my own from cinnamon, nutmeg, and ginger! ), pumpkin purée (like this—not pumpkin pie mix! ), and vanilla stevia (like this). As for the peanut flour, I highly recommend this kind that I used! It contains only one ingredient, peanuts, unlike many other brands that also contain added sugar or other things. I buy it online here—hooray for Amazon Prime! So once you’ve mixed together the filling, you’ll shape it into 36 little spheres… And then flatten those spheres to be just barely smaller than the size of your mini muffin cups. Flattening the filling ensures the tops of your PB cups are smooth and flat too, not rounded from the sphere poking up out of the chocolate! 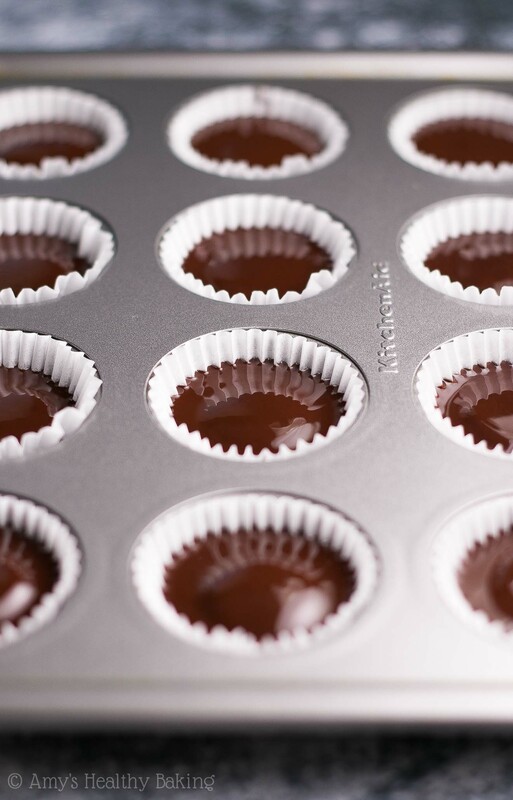 Now fill your mini muffin cups with paper or metal liners… And carefully melt your chocolate. Remember to use regular bars of chocolate, not chocolate chips! Chocolate bars melt better and taste smoother than chocolate chips, which often contain a stabilizer to help them hold their shape. I love Ghirardelli and Lindt for this! Dollop a small amount of your melted chocolate into the mini muffin liner, enough to cover the bottom, and carefully set one of your flattened filling spheres on top. Spoon more melted chocolate on top, carefully spreading it so it drips over the sides of the filling and into every nook and cranny of those liners. Take a bite! How amazing does that look?? ? And when you make your own, remember to snap a picture and share it on Instagram using #amyshealthybaking and tagging @amyshealthybaking IN the photo itself! (That guarantees I’ll see your picture! ?) 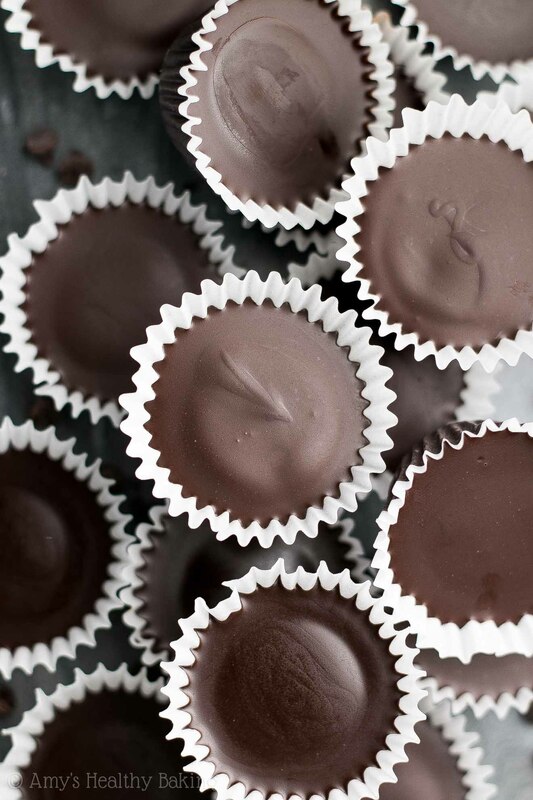 I’d love to see your peanut butter cups and feature them in my Sunday Spotlight series! 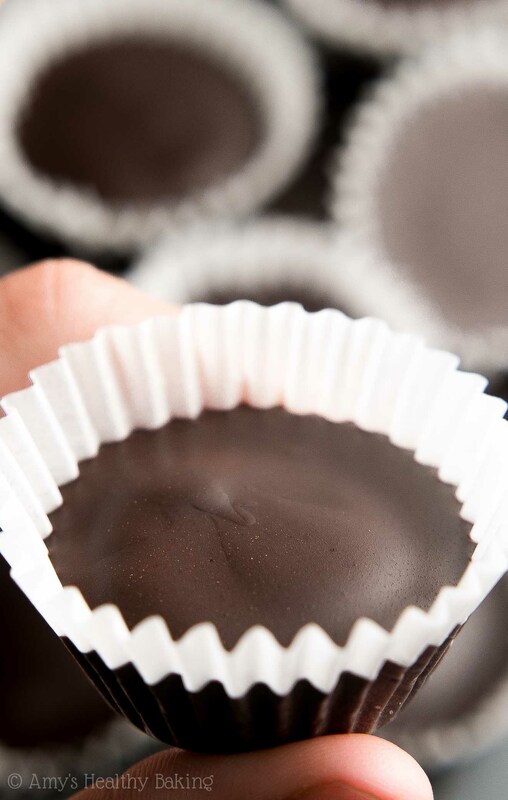 These homemade peanut butter cups taste so much better than store-bought ones! 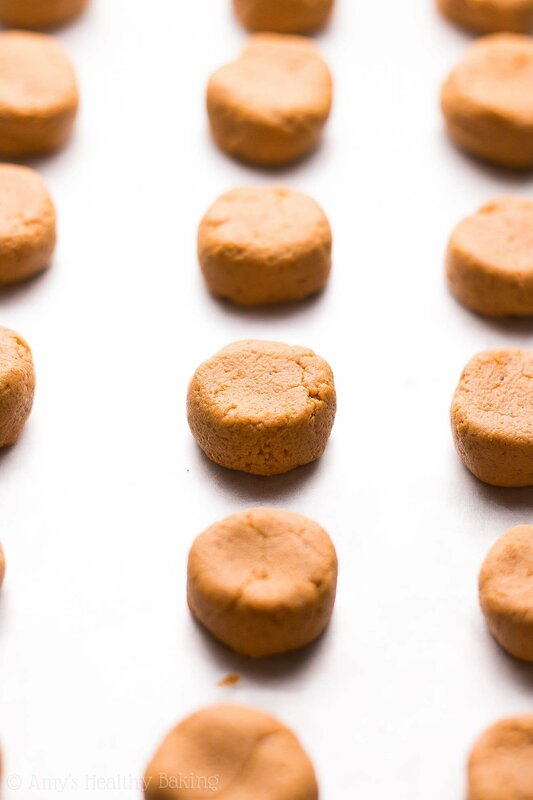 They have an irresistible spiced pumpkin filling (trust me—peanut butter and pumpkin go together like two peas in a pod!) surrounded by decadent dark chocolate. It’s nearly impossible to stop after just one! The peanut butter cups will keep for at least one week if stored in an airtight container in the refrigerator, or at least two months (if not longer!) if stored in an airtight container in the freezer. Place cupcake liners inside of 36 mini muffin cups. Line a baking sheet with wax paper or parchment paper. 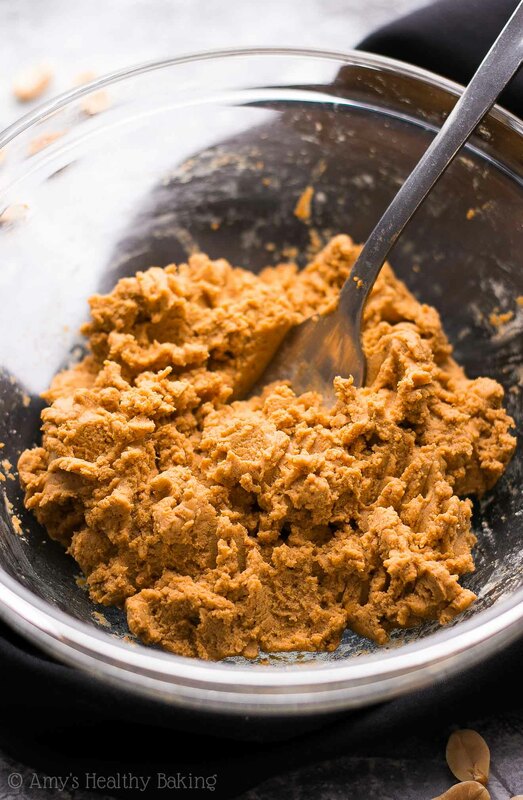 In a small bowl, whisk together the peanut flour and pumpkin pie spice. Make a well in the center. Add in the pumpkin purée and stevia. Stir until completely incorporated. Working with a small amount of the pumpkin mixture at a time, shape into a small sphere. Flatten the sphere until it’s just barely smaller than the mini muffin cup. Place onto the prepared baking sheet. Repeat with the rest of the pumpkin mixture. Once all 36 mini muffin cups have been filled, place them in the freezer for 10-15 minutes (or the refrigerator for 20-30 minutes) or until the chocolate has hardened. Store in the refrigerator or freezer until ready to eat. Notes: For the homemade pumpkin pie spice, use as follows: ½ teaspoon ground cinnamon, ⅛ teaspoon ground ginger, and ⅛ teaspoon ground nutmeg. I highly recommend this peanut flour! It only contains one ingredient (peanuts), unlike many others that contain added sugar or other ingredients. I have not tried with PB2, PBfit, etc. I do not know how those other types will work. I highly recommend using the vanilla stevia! This is my favorite, and I buy it online here because that’s the cheapest price I’ve found. (You’ll use it in all of these recipes of mine, too!) If you prefer powdered stevia, you’ll need 1 ½ teaspoons of this powdered stevia. If you prefer to substitute another sweetener, you’ll need the equivalent of ¼ cup of granulated sugar (or maple syrup, honey, agave, etc). I don’t know how other sweeteners will affect the texture of the filling. Use regular bars of chocolate, not chocolate chips! Chocolate bars melt better and taste smoother than chocolate chips, which often contain a stabilizer to help them hold their shape. I love Ghirardelli and Lindt for this! Flattening the filling ensures the tops of your PB cups are smooth and flat too, not rounded from the sphere poking up out of the chocolate! Amy, these look delicious! I can not wait to try and make them. Reece’s peanut butter cups are by far the favorite candy in our household… so I’m sure these will go fast! You’re so sweet Brooke — that means a lot to me! 🙂 I can’t wait to hear what you and your family think of these! You’re so sweet Marina! My mom says to tell you hello too! 🙂 Moms are the best, aren’t they?? I can’t wait to hear what you think of these, sweet friend! You can! You don’t need the added vanilla; the Splenda alone should be just fine. See the Notes section underneath the Instructions for how much you’ll need. (That section can be easy to miss!) 🙂 I can’t wait to hear what you think of these Caitlyn! These look really good! I think I’ll have to give them a try. Thank you Amy. SERIOUSLY????? 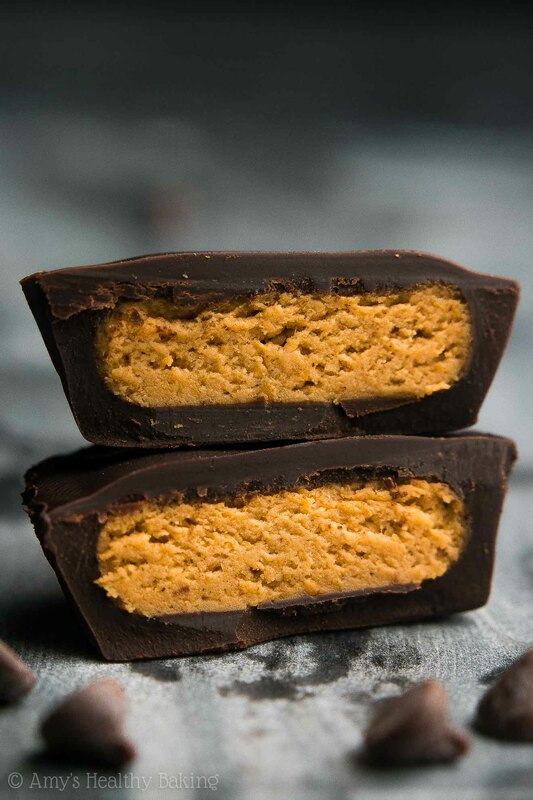 PUMPKIN SPICE PB CUPS!?!?!?! I HAVE to try this!!!! The flavors sound INSANE! #1: YAY for feeling re-inspired and getting out of a rut! Isn’t it amazing how sometimes you need to say something out loud to realize something and make a change?! #2: LOVE this: “But I think that’s what fall, and therefore pumpkin season, is all about: slowing down, embracing the process, and savoring the moment.” <3 <3 <3 <3 <3!! #3: These look SO good. I went through all that peanut flour when I ordered it online (because it turns out to be the only "protein powder" that doesn't make me bloated, haha), but I need to re-order soon so I can give these a whirl. Oh Andrea, you’re such a sweet friend and a true gem!! Thank you SO much for your glowing comment (and your texts this morning)!! ♡ I’m so glad the peanut flour worked for you! That’s awesome!! And sooooo true about #1… It wasn’t until I was talking on the phone to my mom, saying things out loud that I finally identified the feeling. So funny how that works! This is awesome! My grandmother used to make peanut butter cups using chocolate + paraffin wax and peanut butter + powdered sugar. I’m curious. Have you tried experimenting with chocolate alternatives? Maybe carob? I look forward to trying your recipe!